Laurie and Rachel were best friends at school and throughout their teenage years. They spent the summer together in Greece after their A Levels and Laurie was with Rachel when she took a pregnancy test at 19. But over the years the pair have drifted apart, living completely different lives. Laurie lives alone in London in a minimalist flat while working as a fashion designer whereas Rachel lives in a cluttered cottage in a small Yorkshire village with her husband, Aiden and is a stay at home mum to their 15 year old daughter, Milly and 6 year old son, Zak. The pair have kept in sporadic contact over the years so when Aiden's mother takes ill, Rachel asks Laurie a favour. Things haven't been going well for Laurie. Confused over her feelings for her friend and neighbour, Jay, especially when she keeps seeing his new girlfriend in their building, Laurie hasn't been able to concentrate at work. When she makes a major mistake on their latest line, Laurie is asked to take a two month break to sort herself out. When Rachel emails explaining that her mother in law needs to see a specialist in London and asks if she and her family can stay with Laurie for a few days, Laurie comes up with the perfect solution. She needs a break away from work and Jay so she suggests they swap houses. Rachel can experience Laurie's life in hectic London while Laurie chills out in sleepy Skipley. 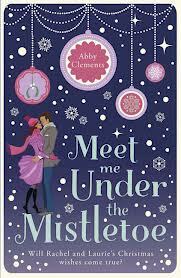 I'd been looking forward to reading Meet Me Under The Mistletoe ever since I saw an image of the gorgeous cover, which is even more beautiful and sparkly in real life. I love Christmas and Meet Me Under The Mistletoe has lots of festive charm, from Bea's Countdown To Christmas (which I long to own) to the Reindeer Wonderland (which I long to go to). There is a diverse range of characters in the book; Lily, Laurie's downstairs neighbour who is warm and loving but misses her own family and Siobhan and Jay, Laurie's best friends and neighbours and in Skipley there is Rachel's grumpy, snobby neighbour, Diana and gorgeous charity worker, Patrick, who helps Laurie take her mind off Jay. The chapters take place over the course of a day, counting down to Christmas Day and alternate between Rachel and Laurie. Usually when a story is told from different perspectives, I warm to one storyline more than the other but I enjoyed Laurie and Rachel's stories equally. I liked how Rachel broke free from her tiny village and began to live more and made new friends while Laurie learned how to take life at a slower pace and shifted her focus away from work. I would have liked to have seen a bit more interaction between Rachel and Laurie apart from the odd email and phone call, to really cement their friendship but other than that I thought Meet Me Under The Mistletoe was a lovely festive read and I'm looking forward to reading Abby Clements' free short story, The Christmas Bake Off, which will be available on 1st December.